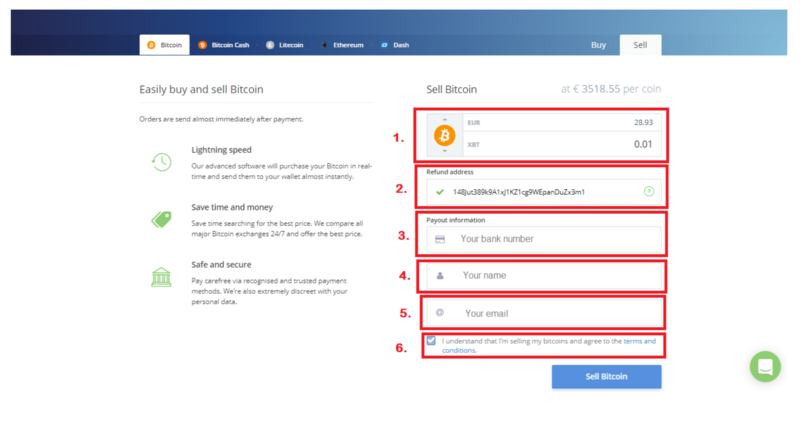 Other than buy orders it is also possible to place sell orders in Bitcoin, Litecoin, Ethereum or Dash on Bitrush.nl. 1. Here you can decide how many coins you are planning to sell in the sell-tab on the webpage. You can either choose an amount of coins you want to sell or an amount of €. 2. Here you need to fill in the coin-address to which you want the coins to be refunded in case of an error/mistake. 3. In this bar you need to fill in your bank account number to which you want to get paid for your coins. 4. Here you need to fill in your own name (make sure that your name corresponds with your bank account). 5. Here you need to fill in your emailaddress to which we will send a confirmation email when you have finished your order. After you completed step 1 to 6 a new orderscreen will appear. 7. You will see a coin-address to which you have to send your coins to, out of your own wallet. You can either copy this address or use the QR-code provided. Sending the coins has to be done within 15 minutes. When your order is not executed in time your coins will be refunded to the given return-address you gave up in step 2. 8. 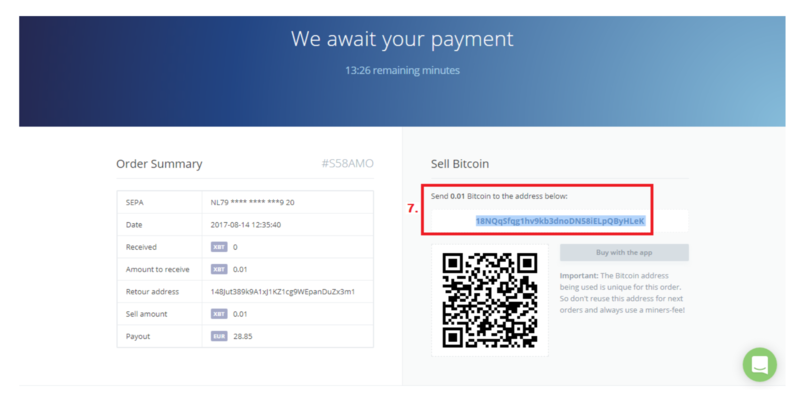 You will have to send your coins from your own wallet to the given address in the previous step (beware that this is sometimes a temporary address that is different for each order). 9. 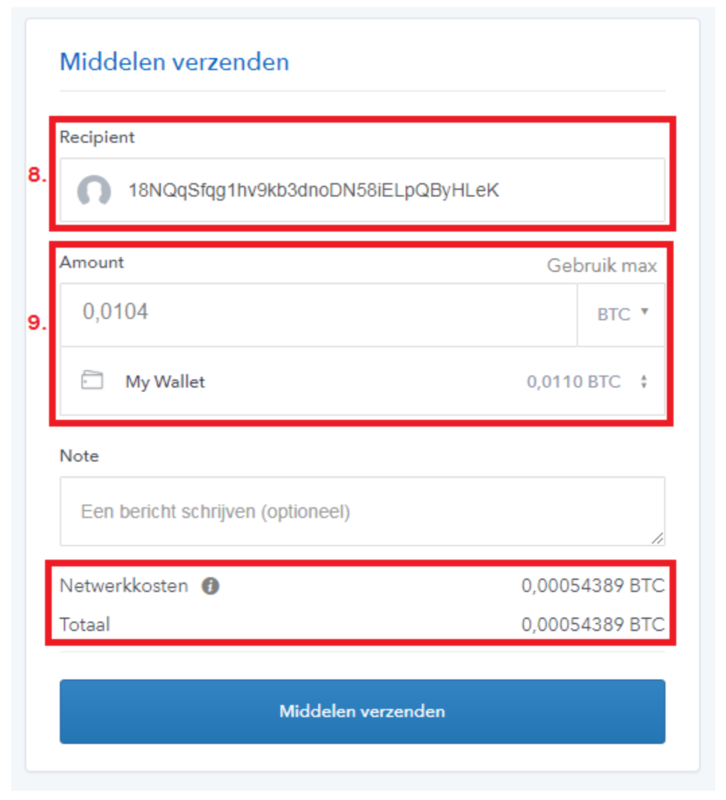 You will have to send your coins to the given address in step 7 from your own wallet. Keep the miningfee in mind for cryptocurrency transactions, so make sure to send a slightly higher amount of coins. When you’ve sent more than the promised amount of coins + the minersfee the surplus will be refunded. 10. Once you will see this page your order is successfully executed. 11. It will take 1 or 2 working days before the money of your selling order is	sent to your bank account (max. 2 days if you have a different banking provider than Bitrush.nl).